Starting a business can be a lonely journey. Most people start their first online business without any help from mentors, guides, teachers, or instructors, which means that they’re hustling on their own to try and build, launch, and grow their own business. This requires toughness and grit to actually buckle down and bring a brand to life, and it often ends up with them asking themselves if they’re doing the right thing at every stage of their journey or questioning whether they’re building their business the right way. This can lead them to doubt their own capabilities and compare their journey to others they see around them, especially online. 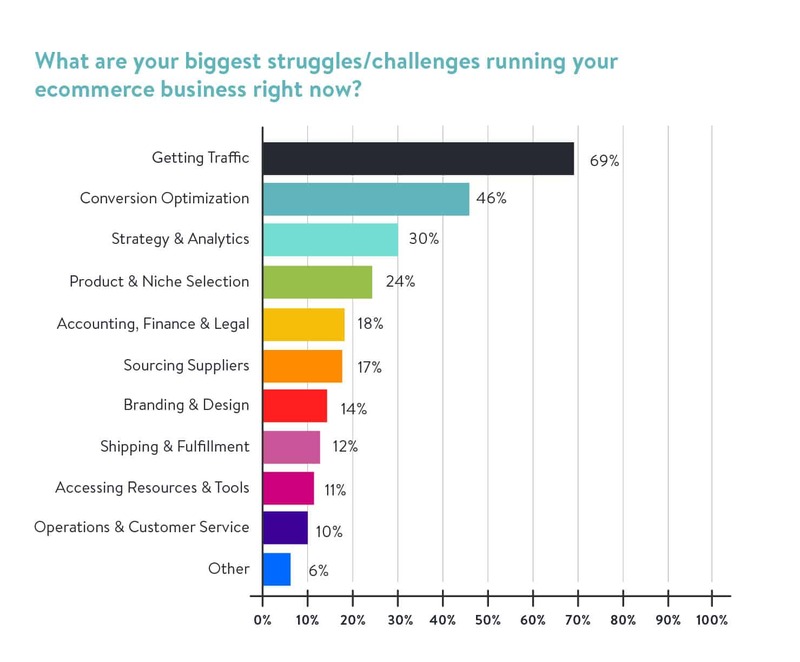 To help stop entrepreneurs from questioning their own capabilities and to help them benchmark their journey amongst their peers, last year we shared some of the results from our Ecommerce & Entrepreneurial Insights Audience Survey. 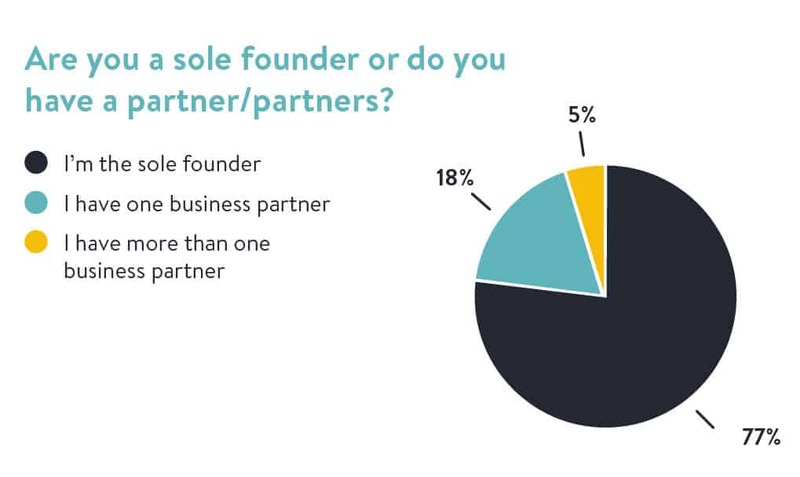 By sharing these results, our aim was to demystify some of the assumptions people might have about entrepreneurship and to help budding an experienced entrepreneurs measure their progress against others who are building, launching, and growing their online businesses. If you’re signed up to our email list, you probably saw us send out this year’s Ecommerce & Entrepreneurial Insights Audience Survey. If you were one of the several hundreds of people who submitted your answers to the ecommerce survey, we thank you! It’s participation like yours that makes informative articles like this one possible. We hope this article will show all entrepreneurs, or “wantrepreneurs,” out there that although the entrepreneurial journey can feel lonely, you are not, in fact, alone. There are other entrepreneurs out there who want to start but don’t know how, there are some who have started building a business but aren’t sure if they’re doing anything right, and there are also many who want to grow their business but aren’t sure what steps to take. Whatever stage you’re at you aren’t alone, and this article can help you understand where your entrepreneurial journey stands amongst those of your peers and can help you manage your expectations as you start, launch or grow your business further. So whether you want to start an online business but aren’t sure how or if you’re just ready to jump in headfirst and start something, the information in this article will give you a glimpse into what others are doing and how they’re doing it so you can compare your progress and plan for your future. 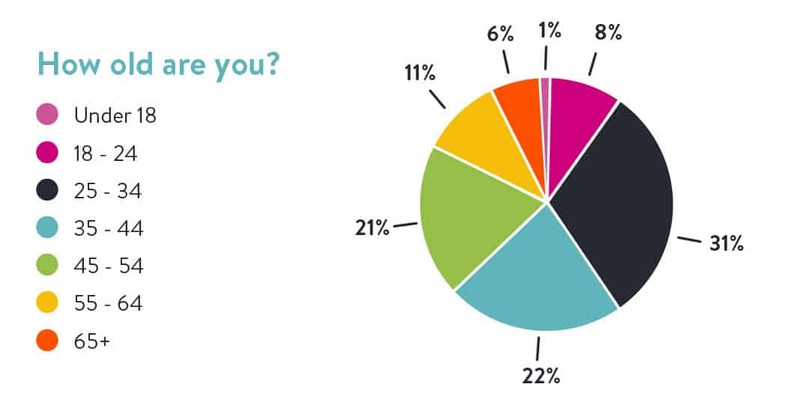 First of all, here’s some information on our audience demographics so you have some context as to whom these ecommerce survey results are coming from. The majority of our audience is made up of adults in the 25-34 age range, and closely following that, another large part of our audience falls into the 35-44 age range. That means that just over 53% of our audience is between the ages of 25 and 44, plus another whopping 20% of adults aged 45-54 consumer our content, which brings it to a grand total of 74% of our audience who are between the ages of 25-54. 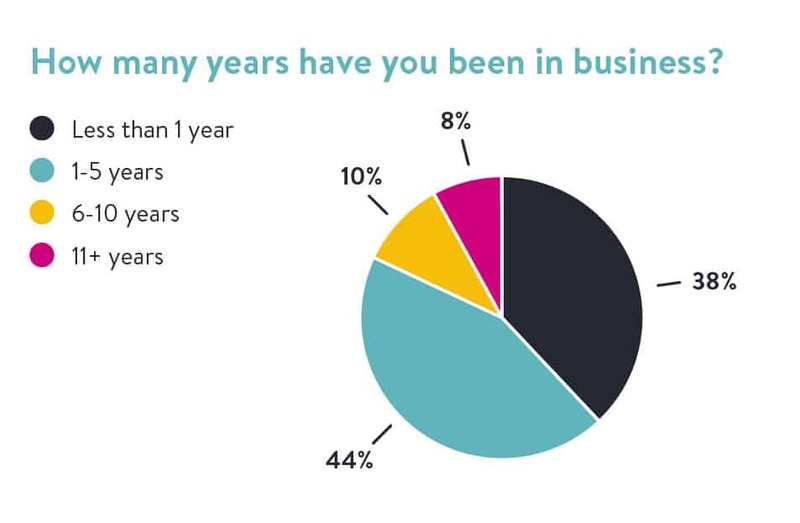 This is a large part of the working population, so it makes sense that this age range of people is most interested in learning how to start a business or have already started their businesses. Only 8% of our audience is made up of people aged 18-24, and an even smaller percentage of adults — 5.6% to be exact — are 65+. This part of the population is, in general, less likely to have the time or funding to invest into starting or growing an online business, so these results come as no surprise. We’ve discussed previously why it’s so important for those who are part of the working population to strongly consider building their own businesses now, as jobs are evolving to become more automated and companies are moving to minimize their workforce in favor of cheaper, less volatile alternatives such as machines and artificial intelligence. It’s encouraging to see that the ones who will be the most affected by the reduction of human job positions in companies in the decades to come are also the ones who are taking action to build their own businesses — whether they’re full-time businesses or side hustles — so they can take charge of their future job security. In similar fashion to last year, the majority of our audience is in the planning stages of building their online business, while a healthy percentage of our audience is already operating their businesses and selling to consumers at large. Our aim here at A Better Lemonade Stand, as we’ve discussed in further detail on our About Page, is to inspire, educate and support entrepreneurs in the early stages of their entrepreneurial journey, so we hope to see the percentage of people who have a business rise as people who are currently in the planning stages of building their business eventually make their way into launching their business. As you can see, the results between the entrepreneurs who have an online business versus those who don’t mirror one another. Their intentions for having started an online business versus wanting to start an online business are very similar and are likely very similar to many entrepreneurs out there who have already or want to start an online business. For those who haven’t started an online business yet, we also asked them what’s holding them back from doing so. The results are pretty even across the board, with most people lacking or being intimidated by the monetary investment, others lacking the time to invest into building an online business, and nearly just as many others lacking product ideas and the adequate knowledge to get started. If you’re one of the people who fall into the lack of knowledge category, we encourage you to stick around our website and try out the many different resources we have for people who want to start their own online businesses but aren’t sure how yet. 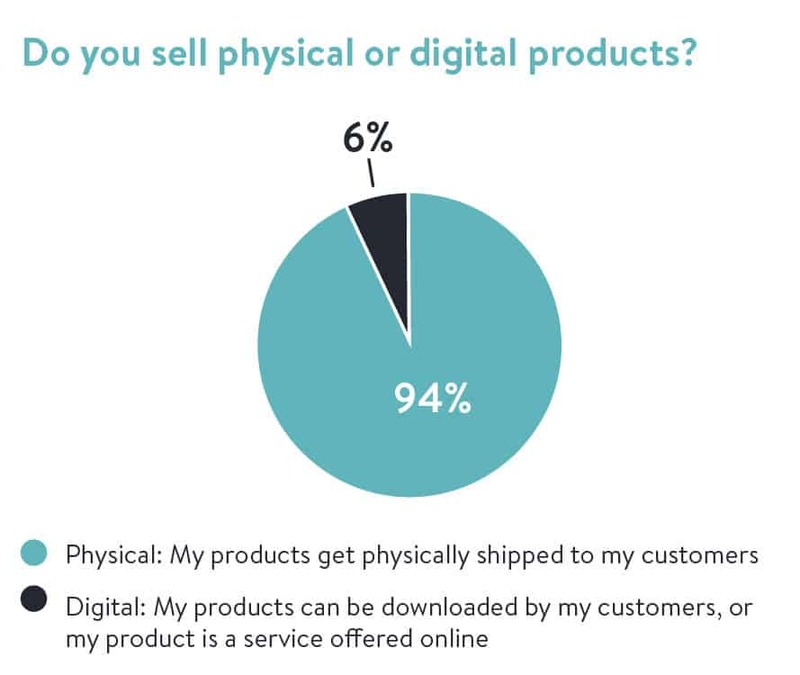 Out of the entrepreneurs in our audience who do currently have an online business, the vast majority of them sell physical products rather than digital products. This comes as no surprise to us as our content primarily focuses on helping entrepreneurs start ecommerce businesses that sell physical products, but we’re noticing a rising interest in people wanting to learn more about what kind of digital product options exist and how to get started selling digital products rather than physical products. We plan to offer more information, advice, and resources in upcoming content to help entrepreneurs learn more about creating and selling digital products, so stay tuned for that. The type of business model merchants use to sell their products is important to know because it dictates how so many other aspects of their business will operate, so we were very intrigued to ask this question from our audience this year. A small majority of our audience mainly dropships their products, which comes as no surprise as it’s one of the most accessible ways to acquire products to sell online, and it’s one of the most efficient ways to start an online business, especially if a merchant is starting their very first online business. We’ve discussed dropshipping at length in our Dropshipping 101: What is Dropshipping? article, so we recommend checking that out if you want to learn more about the dropshipping business model. The least amount of our audience sources their products via manufacturing which again, makes sense. Manufacturing can be a difficult way to acquire products to sell online because there are often MOQs that need to be met, inventory that must be managed, and it’s just generally a much more expensive and time-consuming business model to get started with. 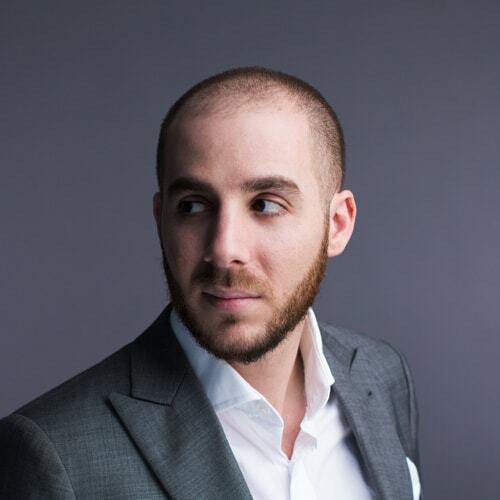 It can be a very rewarding business model, though, because the margins are generally much more generous than any of the other business models, and it also typically allows for total brand and product control. This is a great question you can use to get an overview of which industries other entrepreneurs currently sell in so you can understand what the most popular, and potentially profitable, niches are. Businesses don’t survive in niches that aren’t thriving, so the top niches on this list are likely to be the ones where consumers are most active and willing to purchase products. If you’re looking to start your ecommerce business, consider which of these industries you’d be most likely to sell in look to this list for a glimpse into the size of customer base you’d likely have, and how many competitors you might be up against. The vast majority of our audience who have online businesses are just in the beginning stages of operating them! Most entrepreneurs have only had their businesses for 1-5 years and almost just as many have had their business for less than a year. Remember these numbers when we get to the final section of this article on Financing a Business. The numbers in that section primarily exist within the context of new businesses that have been active for 0-5 years, which is very important to keep in mind. Especially if you’re just starting your ecommerce business, those numbers can give you a good understanding of what your first 5 years of operating your ecommerce business could look like. Next, let’s dive into the data on what our audience is doing and using to run their ecommerce businesses. For those who haven’t started an online business yet, this section can give you valuable insight into tools, tactics, and information you can use to build your future business more successfully, and for those who already have an online business up and running, this section can give you a glimpse into where you stand amongst your peers who also have online businesses on the go. It comes as no surprise that the majority of our audience has built their online business on the Shopify ecommerce platform. Shopify is one of the top ecommerce platforms in the industry and is often the most highly recommended because it’s inexpensive to get started on and offers a host of useful features and reliable support. In our Shopify Review we discussed in detail what makes it such a great ecommerce platform, so if you’re looking for an ecommerce platform to start your own online business on, that’s a great place to start. 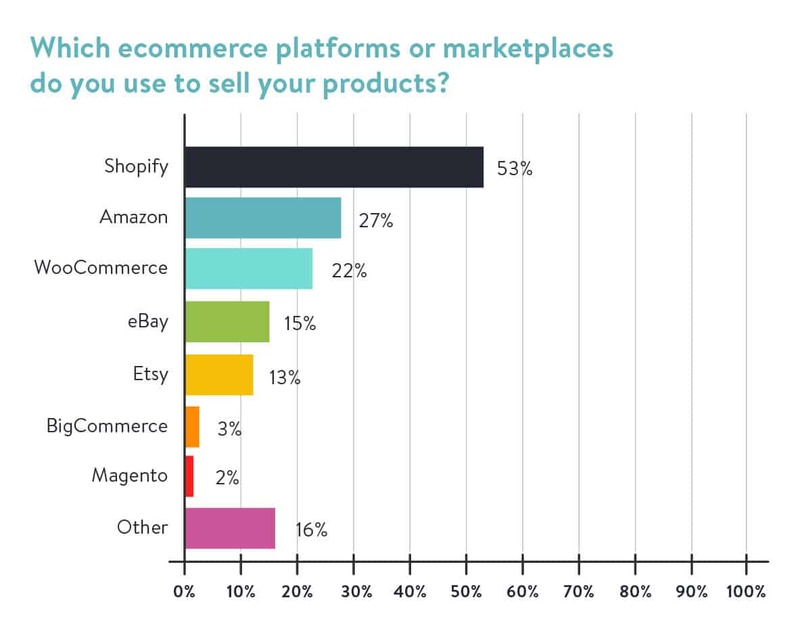 When we conducted this ecommerce survey last year we noticed that a large part of our audience has built their online businesses not only on ecommerce platforms like Shopify, BigCommerce, and Magento but also on ecommerce marketplaces like Amazon eBay and Etsy. Online marketplaces can be a lucrative way for new businesses to launch into the ecommerce industry because there are already customers browsing and shopping on these marketplaces, which gives more exposure to brands listing products on the marketplace and makes it easier to get initial sales. Plenty of ecommerce businesses have their own online store set up on ecommerce platforms like Shopify, BigCommerce or Magento and then also sell on marketplaces like Amazon, eBay, and Etsy. This way they can have the best of both worlds: They can own their own store on an ecommerce platform which means they don’t have to abide by marketplace rules but they can also benefit from the footfall marketplaces attract to help their products be more discoverable and easily shoppable by consumers around the world. 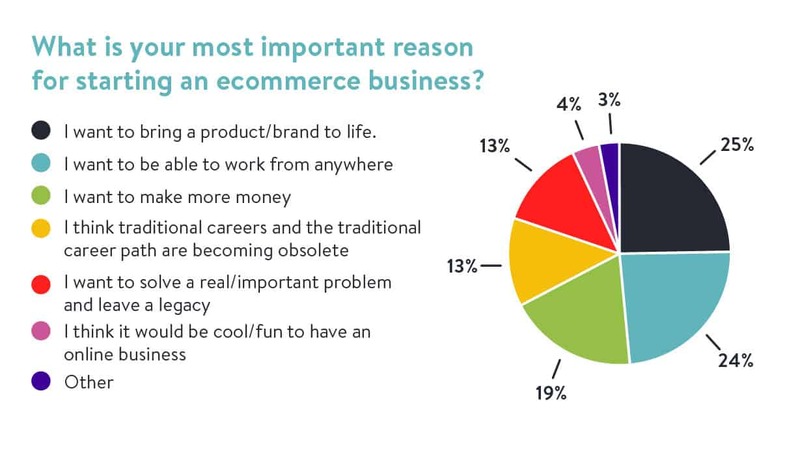 This is one of our favorite questions to ask entrepreneurs with ecommerce stores and in this year’s ecommerce survey, the number of entrepreneurs that are truly passionate about the products they sell and the market they serve has jumped by over 7% compared to last year’s ecommerce survey! It is by no means necessary to only start an online business because you’re passionate about the products you sell or the market you serve, however, it can be helpful in the long run to love what you sell and whom you sell it to. Merchants who are passionate about their products are more likely to stick through the tough times that come with running an online business such as months of low traffic, minimal conversion rates, and high abandoned cart rates. It’s also useful to be passionate about the market you serve because you’ll be more in tune with their wants and needs and will be more likely to create better products and shopping experiences that suit their interests. It’s still very possible to create great products and a great shopping experience for your customers even if you aren’t passionate about your products or niche but it just might take more effort or research to achieve the same results as someone who’s passionate about the market. As you can see, the vast majority of our audience is made up of entrepreneurs who are the sole founders of their ecommerce business. For anyone who hasn’t started an online business yet, use this as inspiration to know that you, too, can start an ecommerce business on your own without the help or support of someone else. Support and guidance from others can be helpful when it comes to starting and running an online business, but just know that it’s not necessary to get started. Since it typically does take some time to bring a business to life and generate a sufficient level of traffic and sales to make it a viable way to earn a living, it’s generally best to work on an ecommerce business as a side hustle first while working your regular job. 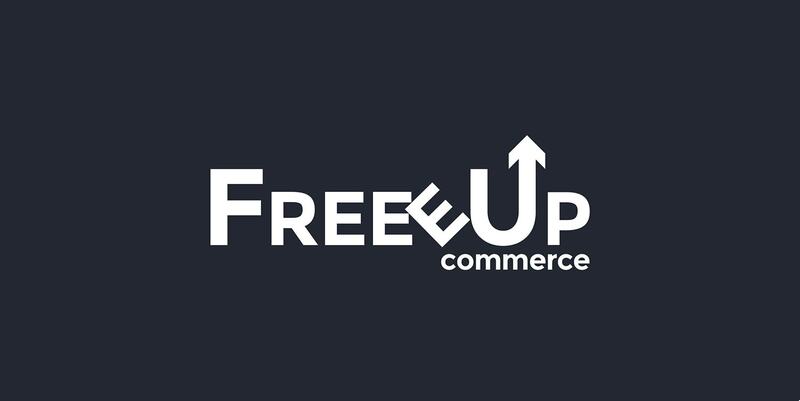 This way, you are less likely to put yourself in a compromising position should your ecommerce business not work out or be as profitable initially as you may have expected. Ecommerce businesses also require a fair bit of monetary investment, whether that’s because of the inventory required to stock the virtual shelves or to fund the ecommerce platform, apps, marketing channels, etc. required to get the business up and running, so it helps to have a reliable source of income that can help cover the initial startup costs. 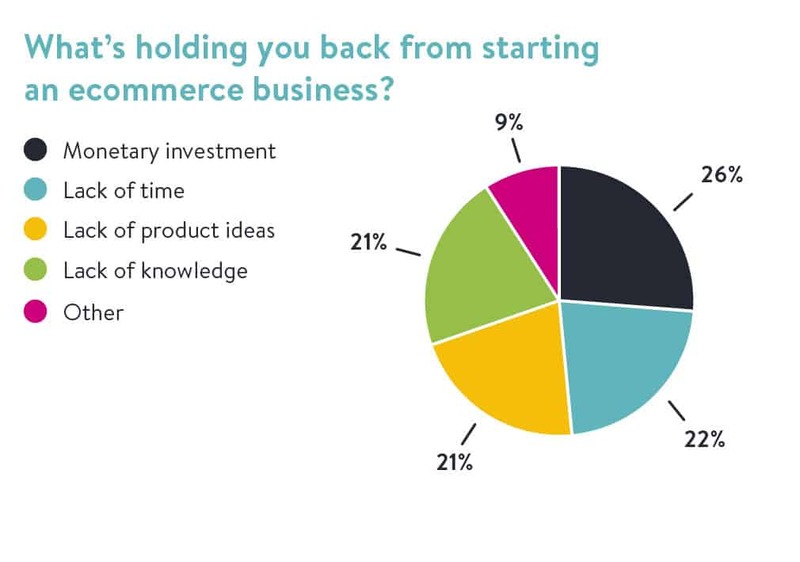 Again, it’s totally up to each entrepreneur how they choose to approach this part of the startup process, but as you can see, the majority of our audience chose to start their ecommerce business while working their typical day job. Interestingly enough, the top sales and advertising channels our audience uses to attract visitors to their online store compared to last year are still the same! The majority of our audience uses Facebook Ads to attract visitors to their online store followed by organic social media and SEO. The number of our audience using these sales/advertising channels has obviously grown by a large percentage, so we’re pleased to see entrepreneurs are making use of these opportunities to grow their traffic. Typically product and niche selection is the area that we notice entrepreneurs struggle with the most, however, this doesn’t seem to be the case with merchants who already have a store up and running! A huge majority of our audience struggles to get traffic to their online store, and we don’t blame them. That can be one of the most challenging and time-consuming areas for entrepreneurs to deal with when starting and growing their online business, and it’s clearly one that many, many entrepreneurs are struggling with right now. Look at these numbers: Over 70% of entrepreneurs failed at least once before they achieved their definition of success. 70%! That’s a huge majority of people. Out of that 70%, most of them considered to have failed 2-3 times before they achieved success and 10% failed at least 7 times or more. This data just goes to show that trial and error is part of the entrepreneurial process and even if you’ve failed in the past when starting a business it doesn’t mean you can’t be successful in the future. Of course, everyone’s definition of success is different and there’s no concrete way to define it, but take these results as reassurance that even if things don’t work out the first time, try again. The vast majority of entrepreneurs don’t create a successful business the first time, so don’t be too disheartened if you finding yourself starting and failing. 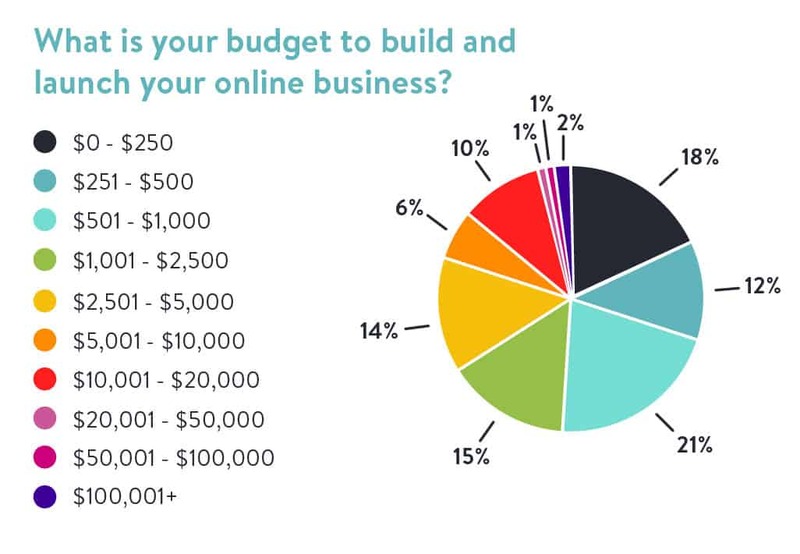 The funds that it takes to start an online business can be a huge deterrent for new entrepreneurs wanting to build, launch and grow their own online business, so this section is particularly important as it gives a true representation of what our audience has spent in the past, and do currently spend, on their online business to get it running and keep it running. If the monetary investment of starting an online business is holding you back, pay attention to the data in this section to see what funds you can likely expect to budget to start your online business. You might be surprised! First, we asked current entrepreneurs who have a business up and running what they initially spent to build and launch their online business. There was quite a diverse range of responses, however, many people were able to build their business with $0-$250 in monetary investments! This goes to show that it’s possible to start an ecommerce business on a bootstrapped budget. 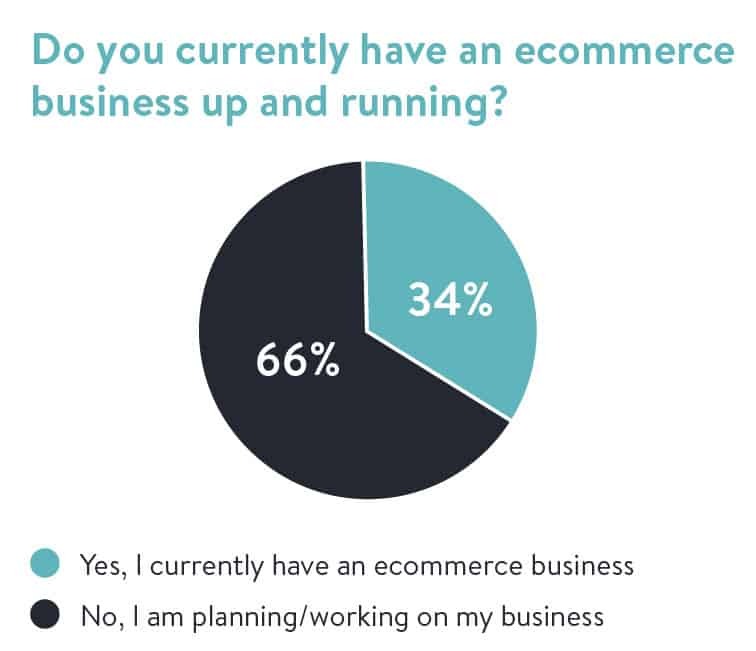 Next, we asked those who don’t already have an ecommerce business up and running what their budget is to build and launch their business when they do start it in the future. While the results were again, varied, many people reported setting aside a budget of $501-$1000 to spend on building their business. There is an interesting difference between the people who have built and launched their online business versus those who haven’t: Those who have, reported spending far less than those who haven’t. This information could possibly demystify the illusion that an entrepreneur must invest a fair amount of funds into their business to build and launch it, when in reality that doesn’t seem to be the case. There are many factors that can play into the startup costs of a business, including initial costs like inventory which can really eat into the overall budget, so an entrepreneur’s startup budget really depends on the business model they choose. Since a significant part of our audience operates under the dropshipping business model which requires less upfront investment initially because there’s no need to purchase inventory, it makes sense that many entrepreneurs in our audience started their business on a low budget. 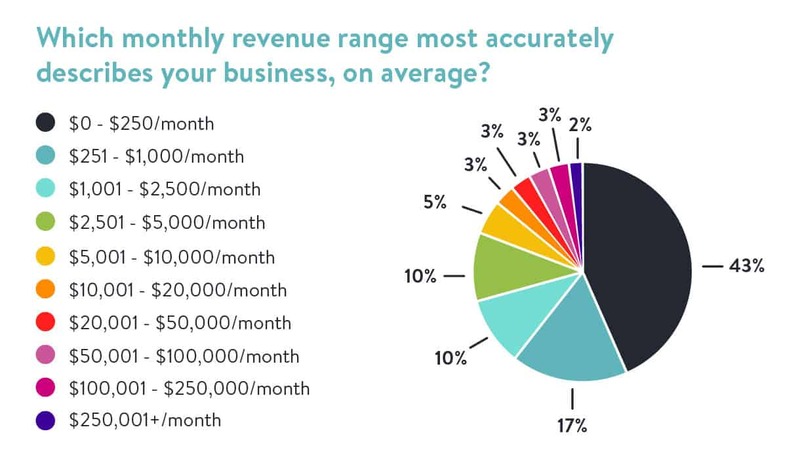 Now compare this data with the previous section’s data: A significant portion of our audience started their business with a low budget, and a significant portion of our audience’s ecommerce stores are earning low levels of monthly revenue. For those who are looking to start an ecommerce business, this data can demonstrate to you what to expect over the few years after launching your online business. Take the above points into consideration and think about how you can combat the struggles other entrepreneurs are facing which potentially have a direct impact on their bottom line. For those who do have an online business, use this data to see how you measure up amongst your peers! Think about where your monthly revenue range would place you in relation to others in our audience. 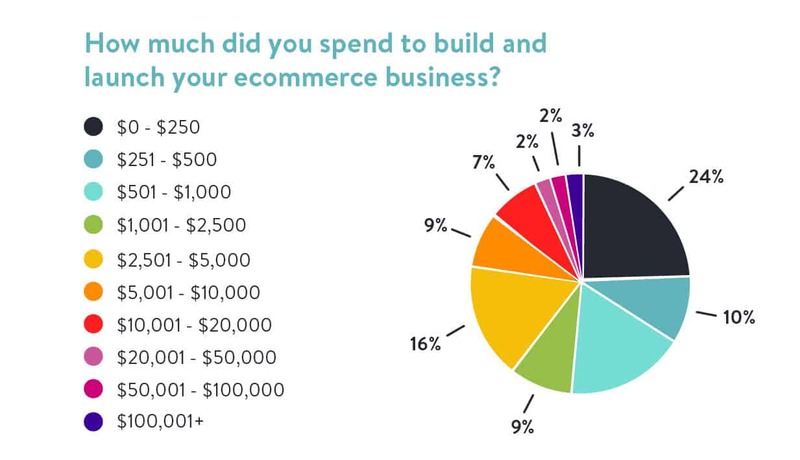 The results for this answer are fairly varied as well, but overall they show that ecommerce business owners in our audience don’t spend a large amount of their monthly budget on advertising their online business. A large section of our audience, 32%, spends $0 on advertising, indicating that they likely rely on free advertising methods such as SEO and social media to get the word out about their business and products. This data shows us that the majority of our audience isn’t spending a huge amount of funds on advertising every month. 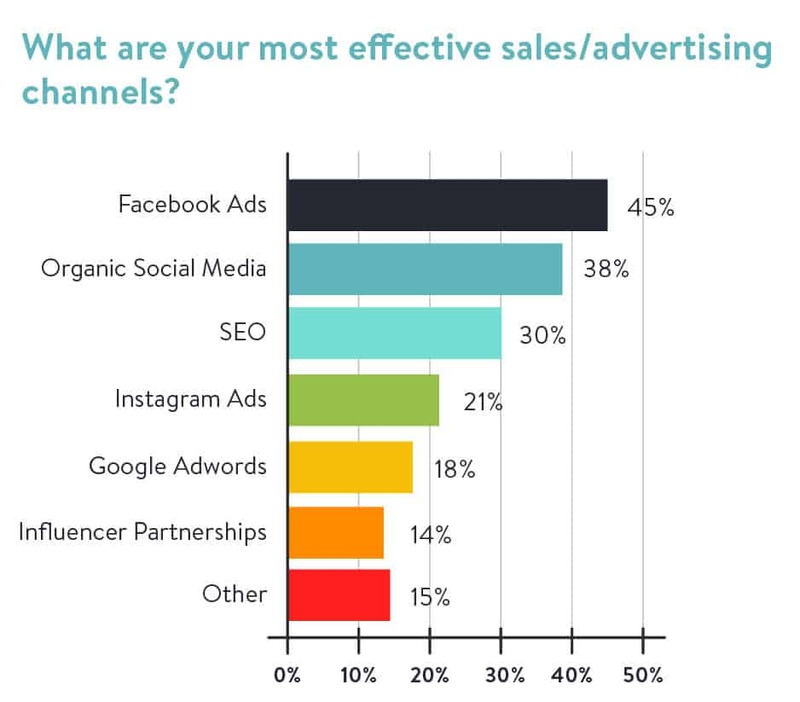 This could possibly mean that either entrepreneurs are using free advertising channels, they’re using inexpensive ones, they don’t like to spend a lot on advertising or they simply don’t have large advertising budgets. 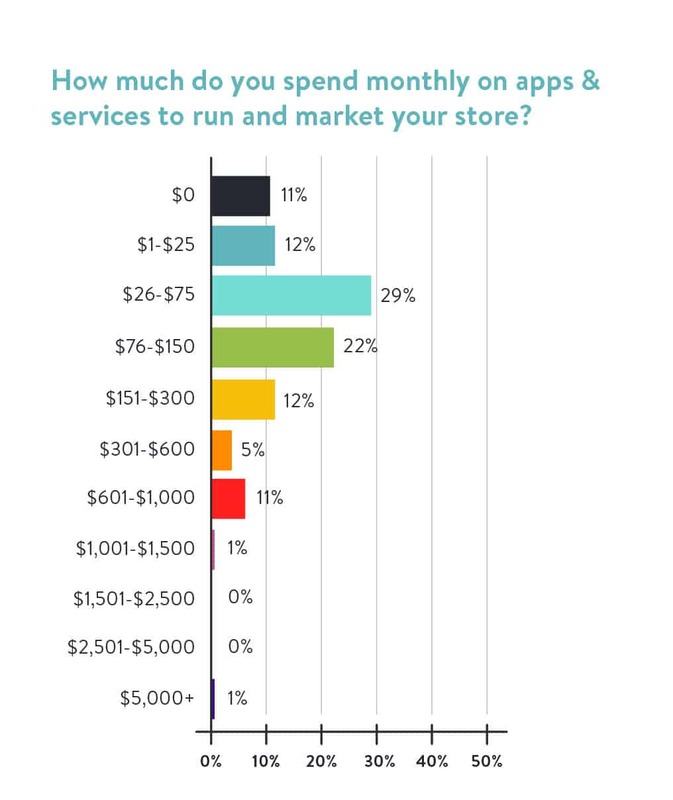 Since a very small percentage of our audience spends $0 on apps and services every month for their ecommerce business, the data from this question shows that apps are useful, helpful and worth the investment when it comes to running an online business. Almost 90% of our audience spends at least some part of their monthly budget on apps for their online business, so they’re clearly necessary and essential for daily operation. The types of apps used for ecommerce businesses can vary from customer service support systems to recurring payments for subscription service business models to email marketing providers or even dropshipping suppliers. There are so many different apps available for online businesses and especially for merchants selling on the Shopify platform, which is the majority of our audience, as it has the best and most diverse pick of apps on the market. Even though you might feel alone on your entrepreneurial journey, we hope that this article has shed some light on the struggles other entrepreneurs face and the choices they make to build, launch, and grow their online business. Use the data in this article as a jumping off point to help you understand what it takes to start an online business if you haven’t already started one, and if you have, use the results to measure your progress and benchmark your success. There’s a lot to take away from the insights learned about our audience in this article, so we hope you can use it to build, launch and grow a better ecommerce business.